I went to a church rummage sale today and all I got was this t-shirt set of badminton rackets and a box of Shiny Brites. And who knew badminton had that weird “n” thrown in the middle? I’ve always pronounced it bad-mitten. Like a fuzzy hand covering that steals your lunch money. But, really. This sale had so much potential. Any time you throw together donated items and little old women running the show, there’s bound to be a good amount of vintage stuff and at good prices. But when I arrived at the sale five minutes before they were to open, to get in line so I could be one of the first people to rush inside the doors, there were already people coming out with their goods! Who the heck opens a church sale, Oh, I don’t know, BEFORE starting time. Are there laws about this sort of stuff? Rummage rules? Yard sale etiquette? Do I need to call the thrifting police? 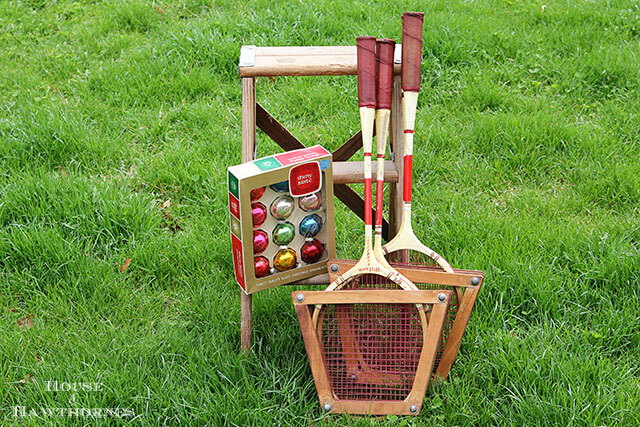 As soon as I saw the rackets, I thought of using them for some sort of outdoor summer decor to be named later. Sidenote: Yes, the grass is much higher in some spots than others because a) dog poop is a fertilizer (and we have two dogs) and b) it won’t quit raining long enough for us to mow it (and pick up huge amounts of previously mentioned dog poop). Loved that they had the wooden racket stretcher thingies attached to them. Heck, I might even take them off the rackets and make something else out of them. The only other thing I saw that grabbed my attention was this box of semi-vintage Shiny Brites. I’m going to guess they are from the 70’s. I never leave Shiny Brites at a sale unless they are way over-priced or broken. Never, ever, ever. There’s just way too many uses for them at Christmastime. BTW, normally when I’m shopping a church sale I end up leaving a little extra for the cause. But not today. Don’t mess with a thrifter. OK, I’m pretty sure I’ll go back tomorrow to see if they have any late donations coming in and I’ll leave a little extra then 🙂 24 hours is my limit on holding a grudge. So, have the sales started firing up in your area yet? Any good church stories to tell me? Besides Noah and the ark and that sort of stuff. Can I admit I’m just envious that your grass is actually green AND it’s long enough to mow! I see a fun vignette with those badmintons. Oh, they definately need a law….but they do that here too! I always mumble about that if I go somewhere and that happens….that isn’t fair…. (insert stomping of feet)!! Darn, and you had such high hopes. I feel your pain. At least you walked away with a handful of fun treasures that are sure to be used in the most creative ways. 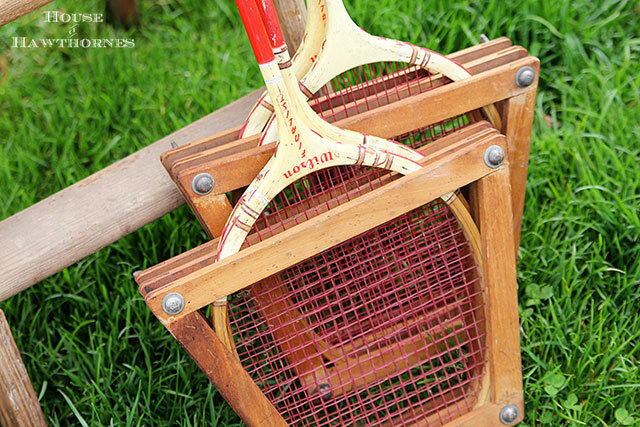 I believe they are tennis rackets, typically badminton ones aren’t in presses.Unless someone just put then in there. Everyone talks about these great church sales, but I’ve never enocuntered one. There is one in town that I know is HUGE, but I have heard that people start lining up at 5:00. FIVE IN THE MORNING. I like junk, but I like sleeping more. There is one church sale in my small town that I always go to and find a couple bags of things for a few dollars. Last year the LOL (little old ladies) couldn’t tell if a tag said 25 or 75 but they decided whatever it was couldn’t possibly be worth 75¢, so 25¢ it was. What will the prices be at church sales when WE are the LOL running the sales????? The church in my hometown has a great one, but I haven’t found one here, yet. 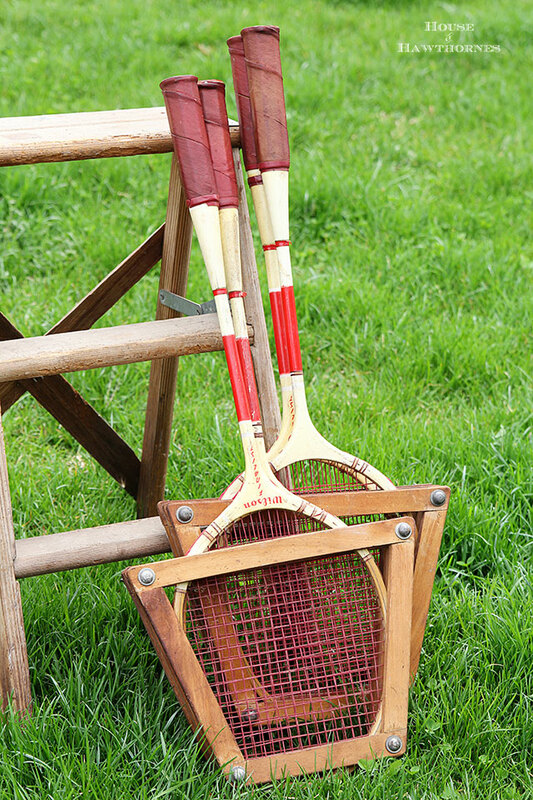 LOVE those rackets and stretchers. GREAT find. I hate it when a sale starts before the advertised time but I have been on the other end of that and have gotten in early on occasion so I guess it all even out. 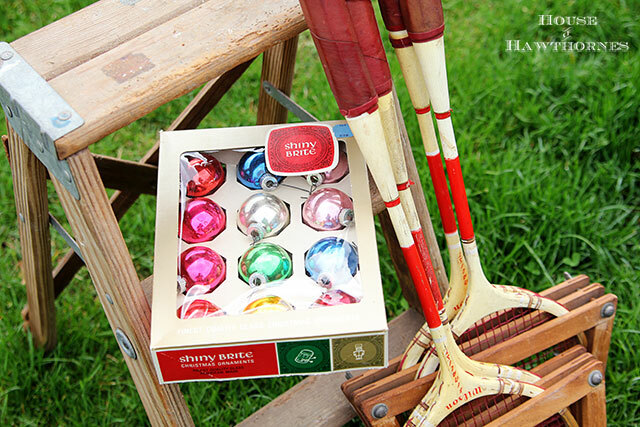 Those rackets are perfect for Summer decorating! Kind of like ice skates in the Winter but I’m so over the cold that I am not going to talk about it anymore….ever. I’ve never been to a church sale that opens up any earlier than 5 minutes before the advertised start time. But, I always try to arrive at least 20 minutes early- just in case the “church ladies” open early. The racquets are very cool!